For a long time, social good could only be measured in vague perceptions of public opinion. Despite the fact that philanthropy has existed for ages, non-profits and charitable organizations still lack the tools necessary for reaching new supporters at scale. For most non-profits, marketing budgets are tight, if they even exist. That’s why social media is so powerful and why non-profit and charitable organizations have been some of the most ardent social practitioners, using the channels to reach audiences without a significant investment. Brands that have partnered with non-profit organizations, and put their social mission in the spotlight are taking the world by storm. Consumers love companies that are committed to positive social impacts. But financially supporting a charitable organization is only one step in the right direction. Sustainable organizations understand that they must reach beyond their existing base and grow their community to attract new supporters that can help reach even bigger goals. That’s where influencers come in. These powerful advocates have huge audiences and the ability to amplify a charity's message exponentially to acquire new donors, generate awareness, and build thought leaderships at the highest levels. Non-profits need easy ways to share their stories and spread their message with the world. We believe that brands and social influencers together can be a powerful voice to create positive social, environmental, and economic change. Snips Social Good is the first campaign platform of its kind that connects non-profits with influencers to create meaningful change. 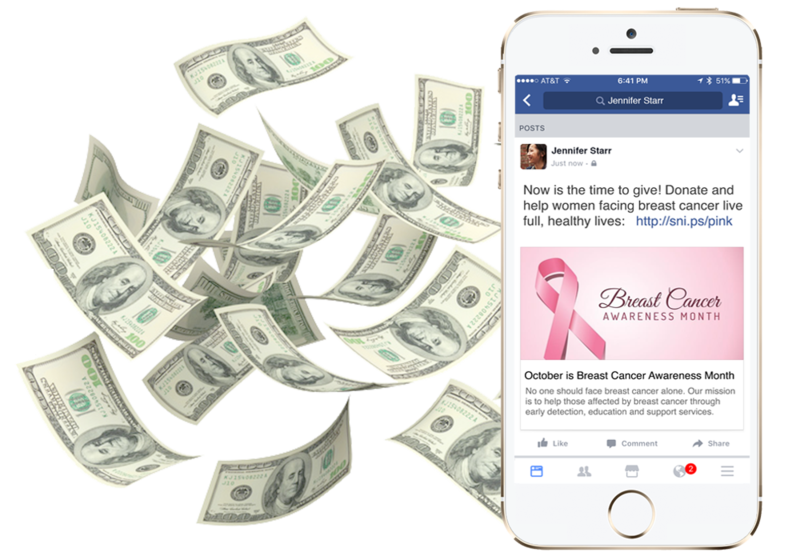 Social Good campaigns offers non-profits next generation advertising technology to dramatically improve their online fundraising through social media and brand sponsorships. We have re-invented the concept of sponsored posts, uniquely designed to provide a platform for charities to partner with influencers to reach new supporters. Any non-profit or charitable organization can easily promote their cause, solely or through brand partnerships, while influencers spread the message across their social channels. The result: significantly higher audience engagements and donations. But it get's better. 100% of Social Good campaign profits are donated directly to the charity. Meaning, influencers are not only building awareness, but they are also directly driving financial support. And the more you share, the more these incredible organizations benefit. To maintain accountability, Social Good campaigns operates on a performance-based cost-per-click (CPC) model. We empower non-profits with the right tools to grow their supporters based on measureable results, and the ability to track campaign performance in real-time. No other platform provides the automation, flexibility, and scalability of Snips Social Good. Social Good campaigns allow influencers to promote non-profit and charitable organizations to reach new supporters across any social media or online platform. Influencers snip and share the link to the Social Good campaign, adding their own message or voice to the post. When followers click on the snipped link, they are taken directly to the content page. How does Social Good help charitable organizations? Social Good campaigns let influencers selflessly promote your organization to their social followers to increase awareness, support, and donations. These campaigns are non-paid to influencers. Rather, 100% of campaign profits are donated directly to the charitable organization. What types of organizations can I promote with Social Good campaigns? Any non-profit or charity that is legally registered as a 501(c)(3) organization. How is Social Good different than native social media ads? Social Good is a universal advertising platform which can be posted to any social media, like Facebook, Twitter, LinkedIn, or Pinterest. It appears as native content in your profile, with the addition of your own voice added to the post. While most social media advertisements operate on an impression model with no garauntee of engagements, Social Good operates entirely on a performance-based cost-per-click (CPC) model, so you only pay for real results. Social Good campaigns automatically count unique visitors per 30 days. You can additionally limit your campaigns to specific countries. Can I choose Influencers for my Social Good campaign?